A four-bedroom stone villa with a private pool. 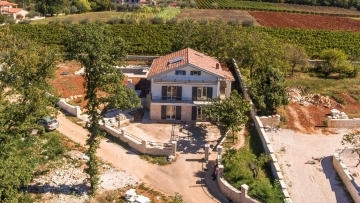 It was built in 2005 using local Istrian stone and reclaimed materials. It has a panoramic view over the Mirna valley and across to the medieval hilltop town of Motovun. All bedrooms have an en-suite bathroom, air conditioning and terrace. The large and air conditioned open concept kitchen/dining/living area has terrace doors leading to the garden, a stone built barbecue, a covered dining terrace and the pool. The villa is sold fully furnished.